It's been nearly a week, but I ran a race. This HUGE for me. I've ran a whopping three races before, and they've all been 5K races. I like racing, I really do, but I'm also pretty (read: a lot) broke at all times, and paying $20-$40 to run 3.1 miles with nothing but a banana, cotton t-shirt full of logos and maybe a 'complimentar'y watery beer doesn't really fit in with my budget. I'd rather run 3.1 at home and enjoy 1/6 of an $8 6-pack when I get home. 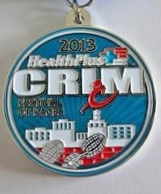 A friend talked me into running the Crim race a few weeks ago, and I was ready to register for the 8K version of the race. I whined that she and her running group were really fast (they are) and I was really slow (I am) and that the rest of the girls in her group would be cranked when they had to sit around and wait for me to cross the finish (they weren't). Then I started getting angry at myself for wimping out on the bigger race (and medal). As soon as I learned that the 8K started waaaay after the last wave of 10 Mile runners took off and realized they'd have to wait for me anyway, I held my breath and registered for the 10 Mile. Hold up. Let's quickly mention that my LONGEST run had been 7 miles. A slooow 7 miles. The race was packed. Corrals for the 10 mile race alone were filled with about 8,000 people. I'd guess it was really well organized but I've never been in a big race before so I have no frame of reference. We got to the corral with about zero seconds to spare, so there was no time to worry or wonder what would happen. We were almost immediately off. And I had a BLAST. For 2 hours and 10 minutes (told you. slow.) I was almost constantly happy. There were about 10 minutes during mile 2 where my shins were on fire, but thanks to adrenaline, stretching or just easing nerves the pain disappeared really quickly, thank goodness. There were beer stops. There were other people that had to stop and walk. Every racer was friendly and every spectator was friendlier. The weather was perfect. People were cheering nonstop. Residents of the neighborhoods lined up in lawn chairs on their driveways and cheered their faces off for total strangers. Volunteers held up signs telling me I (well, everyone) was amazing. There were HILLS, but each time I got discouraged a downhill run made me feel like a damn speed demon. It was perfect. I was on mile 7 when I realized that I still felt great and there was no way I wasn't going to finish. By mile 9 I was pretty tired. I walked for awhile because I wanted to save energy to finish strong. As soon as I hit the brick road that led to the finish, I took off running (again) toward the finish line. I was exhausted, getting sore and my Honey Stingers were wearing off so I was hangry - but I got chills, actual chills!, once I was a few steps from the finish line. I didn't stop looking at my medal for hours once I got home. I barely got off the couch for the rest of the day, but it was totally worth it. I've never felt so great in my life. I still can't believe I did it! When all your runs are slow, what's a bad run? 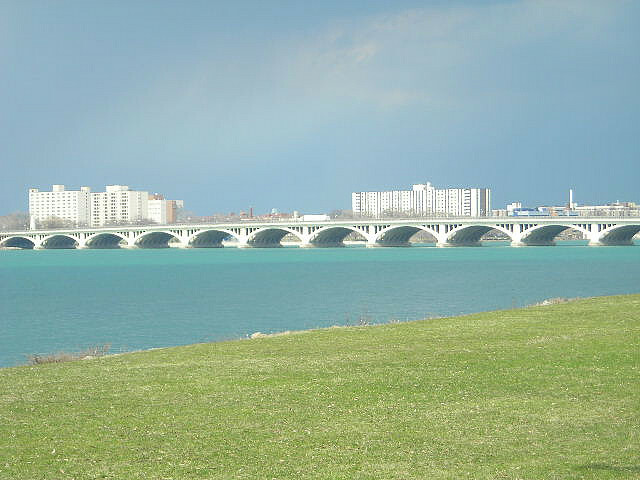 There's a really lovely island park, Belle Isle, near my home. There are small but lively beaches, a wicked fun water slide and a golf course - all of which I've taken advantage of. The island is also a pretty perfect round track that I decided to give a try a few days ago. My question last post was whether or not hotter temperatures and bad scenery squashed my mojo and worsened my runs. This particular 7-mile island run was pretty gorgeous and since the parks were pretty quiet I got to share a few nice words and high fives with runners, walkers and cyclists (save for a few back road minutes that were boring and lonely) but it was REALLY. EFFING. HOT. I left home at 9am so that I could get running by about 10 after and even with almost 5 entire miles of water only a few feet away from me it was hot and humid and not at all breezy and I'm lucky that damn island is round because if I didn't have to get back to my car I'd have quit at least 10 times. I finished. 7.2 miles, bridge entrance to bridge exit and felt pretty beast mode when I was done. Mostly, though, just because I was done. Even for a slowpoke like me my time was pretty poor. Almost 1:30 for the 10K and 1:45 for the entire thing. Almost 15 minutes per mile, a lot of which were walking thanks the many, many awful heat induced feels. I only ran twice the rest of the week because I was feeling so terrible after that run. At least it helped me learn the lesson that I need/want to work on not only endurance (and with that, speed) but also my own motivation. I hope that after my next bad run I'll be motivated to do better next time rather than feel bummed and wanting to quit. An experiement with two variables. Or, too - as in, too many - variables. Saturday is supposed to be my long run, but I decided to switch it up this weekend and push my long run until tomorrow. There is a 10 on my calendar, but I'm aiming for 8. I've already said I'm behind, so let's not start judging, now. I was supposed to work this morning and was going to get a ride in so that I could run home. My office door to home door is just over 8 miles, so it seemed like fate. Then my event got cancelled and my long run plan was up heaved. I'm still pretty pumped to not have to work extra hours on a Saturday, so it's all good. Now. Let's set up my experiment. I've already said that I run better near my office in downtown Detroit. I've also noticed, after a careful review (read: glance at Nike+ Running) that I also run better in cooler weather. Which! It just so happens that it's always been a bit cooler when I've ran near work. I can't figure out if it's the cooler temps or the kickass scenery that always help me to run better. My hypothesis has always been that I run worse at home because I'm bored with my route and nothing interesting ever happens. I also now suspect that the weather has a whole bunch to do with it. This weekend I'm lucky (not really) enough to be able to run in wicked hot weather both days. Saturday at home and Sunday in a gorgeous park downtown. So far I squeezed in 3.5 miles today on the most boring side streets in the world near my abode with 80+ weather and I, not surprisingly...ran like garbage. The worst. It's a miracle that I managed even 3.5mi. I'm trying to get myself in the mindset of 8 miles for tomorrow. We'll see if I do any better in a park that is happy, scenic and lively - yet still blazing hot. Oh, and even more important, the route that I'm running tomorrow is part of the route for the half marathon I'm training for so it will give me a change to check out the course and anticipate my pace and finish time. I'm about 3 miles behind on my long runs. When I glance at my schedule I see that this Saturday I should be running 9 miles, but the longest run that I've had was 6 miles. I know that what I need to do is run 7 miles this Saturday, but I can't help being disappointed that I'm off-track. The weather was a lot cooler today than it's been the past few weeks and I really felt the difference in my running. I made it 4.5 miles today and had my a (for me, at least) really great time! In addition to the weather, I think the scenery really helped. I ran downtown Detroit today, and it was a huge improvement over the same blocks that I run over and over near my house. Getting to cruise past a major league baseball stadium is out-of-this-world-better that cruising by some craftsman style bungalows no matter how cutely they may be fixed up. Whatever the reason, I'm pumped that I was able to make pretty good time. 4.5 miles in under and hour is still a really huge accomplishment for me and after how down I was following my last run I'm really pumped to boost my self-esteem. I've toyed with the idea of blogging for awhile. I've also toyed with the idea of accountability for awhile. Not to mention I've got a pretty short memory. Wouldn't hurt to keep track of a few things. Right? I want accountability for - and a record of - my running. Run/walking. Attempted running. Running. I decided to do something scary today and I signed up for a few races. Some real heavy hitters, too. A 10k and half marathon. The scary part of that is that I am a really terrible runner. Signing up for the races is terrifying because I've been steadily training for two months and I'm STILL a terrible runner. I started Couch to 5K and was doing fairly well and sort of abandoned the idea of it because the mileage that I needed to train for a few races was more than I could fit into the C25K time frame. Maybe going out on my own wasn't the greatest idea, but going backward isn't really and option now. I'm not worried about speed. I'm not even (terribly) worried about injury because I'm being very careful and only doing what I'm able to do and what feels comfortable. What I'm most worried about is my endurance. I've been running(/walking) for weeks now and my endurance level is still the same. I can still run the same distance before stopping to walk. I'm still barely making a 15 minute mile and it's really starting to get me down! I didn't sign up for any races to win. My goal is to complete, not compete, but I'm barely even confident that I'm going to be able to do that at this point. The idea of a last chance pacer kicking me off the course causes my stomach to sink and I get so nervous that I want to quit. My first long race is six weeks away. Six! I keep telling myself that I've still got six weeks until the race (and then 10 weeks until the next race. And then 14 weeks until the next race.) to train and then I immediately remind myself that I've already been training for six weeks with little to no results. As much as I don't want to quit, I also don't want to humiliate myself. I know that increasing my endurance is 100% up to me and I'm hoping that if I start recording my running then a pattern might appear.